It’s widely-known that Tetrahydrocannabinol (THC) is the active ingredient in cannabis and the reason people experience a psychological high. Less widely-known, however, is what happens to THC in the body and how that impacts the psychological high. This post presents a summary of scientific research on the human metabolism of THC—visualized and explained in simple language. Originally, my goal was to write on the effect of cannabis in breast milk (update: which I now did) but as I got deeper into the subject matter I became fascinated with the metabolic pathway of THC and what that means for its psychological effect. I learned why—also on a molecular level—cannabis turns into a different kind of drug when it is eaten vs. smoked, why it has such a long half-life in the body and how inhalation technique greatly impacts bioavailability. I spent two months reading my way through scientific papers not freely available to the public, analyzing original data and making sense of it all. The majority of sources for this post are from scientific journals and occasionally from Wikipedia for definition purposes. I was surprised that I couldn’t find any infographics on the subject. So after collecting all this data, I decided to create an infographic myself that sums up the human metabolism of THC. Enjoy and feel free to share it. I encourage you however, to read the post as well, since it contains additional information that goes beyond the infographic. To understand the pathway of THC in the human body, you must first understand what THC does when it hits your body. You might find the biochemistry part at the beginning challenging. I certainly did when I started applying myself to the topic. Believe me, it’s worth it—I promise the reading gets easier and incredibly interesting further on. Again, in the liver, delta-9-THC turns into 11-OH-THC which turns into 11-COOH-THC. You’ll need to remember this as I will now explain how THC travels through the human body. Note: The three THC molecules have different properties. For the sake of clarity I’ll call them by their full names—delta-9-THC, 11-OH-THC, 11-COOH-THC—unless I mean THC in general. Whether one inhales or ingests cannabis makes a big difference in terms of the metabolic pathway that THC takes through the body. And as we will see in the sections to follow, that pathway will impact the efficacy of THC. When cannabis is smoked or vaporized, delta-9-THC enters the bloodstream via absorption through the lungs. Once in the bloodstream, the delta-9-THC travels straight to the heart, and the heart then pumps it through the entire body—including the brain—allowing it to bind to cannabinoid receptors. The psychologically experienced high kicks in as the THC molecules pass the blood-brain barrier and bind to receptors in the brain. CB2 receptors, which are activated by cannabinol and found primarily in the tonsils, spleen and white blood cells. Each time the blood circulates through the body, a certain portion of it passes through the liver. There, psychoactive delta-9-THC is metabolized into psychoactive 11-OH-THC and non-psychoactive 11-COOH-THC. Afterward, these two metabolites travel along with delta-9-THC to the heart and from there throughout the body. Like delta-9-THC, 11-OH-THC also binds to CB1 receptors in the brain. When ingested, delta-9-THC enters the bloodstream through the walls of the stomach and intestines. Tests with radiolabeled delta-9-THC molecules show this process to be highly effective, with 90-95% of delta-9-THC molecules being absorbed, depending on the carrier medium.3 When absorbed gastrointestinally, delta-9-THC travels first to the liver where most of it is eliminated or metabolized before it has ever had a chance to activate a receptor. After this first pass through the liver, the remaining delta-9-THC and both its metabolites get to the heart and from there into circulation. Delta-9-THC and 11-OH-THC reach the brain simultaneously. How much of the consumed THC actually makes it into the bloodstream? There is no easy answer. The fact is that bioavailability fluctuates wildly. Which produces stronger effects, inhalation or ingestion? Looking at this chart I was tempted to conclude that inhalation produces a stronger psychoactive effect than ingestion but there are a number of problems with this assumption. First is that with bioavailability fluctuating wildly between users, it’s difficult to determine the right dose for a fair comparison. Should you compare smoking 13 milligrams to eating 20? Or should you compare it to eating 40 milligrams, considering the much lower bioavailability of delta-9-THC when ingested? Second—and more importantly—THC blood levels are a terrible indicator for the magnitude of a psychological high. 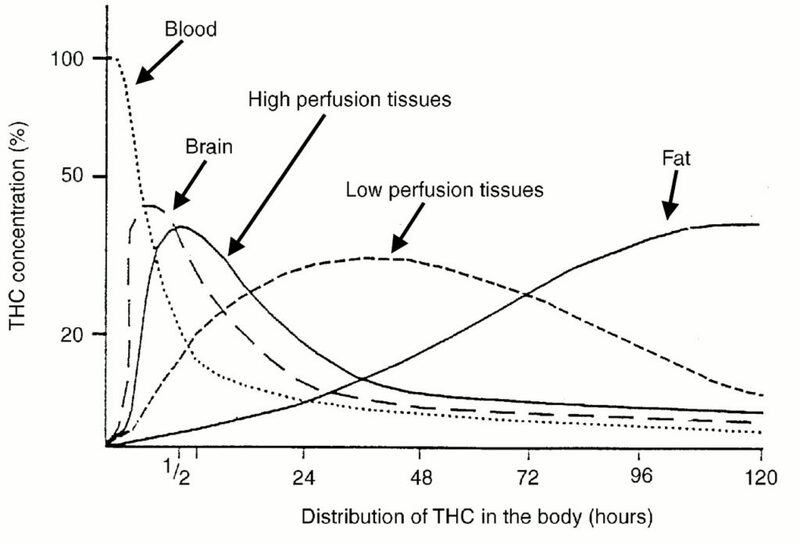 THC blood levels are a terrible indicator for the magnitude of a psychological high. Psychoactive THC binds to CB1 receptors in the brain. That’s why a few minutes after inhalation we already see higher THC concentrations in the brain than in the blood. As you can see in the chart above,7 after smoking THC there is a time lag between concentrations in the blood and brain. That’s why high THC levels in the bloodstream don’t mean that the user experiences a psychological high at the same time. Finally, THC is not just THC. 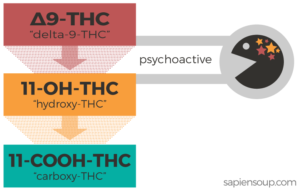 Some studies suggest, that the psychological high correlates better with the blood levels of the metabolite 11-OH-THC whose absolute representation would be much lower than the one of delta-9-THC.8 More on this in the next and final sections. Just around the time when THC concentration is at a high point in the brain, psychoactive effects start to manifest. In the study described below, users were asked to rate the intensity of their experience over time on a scale from 1 to 10 in both inhalation and ingestion scenarios. The second tab above shows the same data for ingestion of 20 milligrams of delta-9-THC. Note that the time axis contains different values. Gastrointestinal absorption happens more slowly and usually results in a continuous rise and fall of blood levels and psychological high. Keep in mind that the values represent only averages. While person A experiences a “3”, person B might experience a “9”. Therefore the chart has to be taken with a grain of salt. Comparing the psychological high over a timescale from 15 minutes to 360 minutes (i.e. 6 hours) reveals the potency of delta-9-THC via the pathway through the stomach. Many users claim that edibles produce a stronger and more “psychedelic” effect when compared to smoking. Unfortunately, there aren’t many studies that have assessed the quality of psychological effects across different methods of intake. Based on the data I’ve found, I can neither support nor dismiss such a claim. An insight the data does provide, however, is that the ratio of delta-9-THC to 11-OH-THC impacts the intensity of the psychological high. And this ratio depends directly on the method of intake. The ‘first-pass effect’ through the liver drastically changes the ratio of the two psychoactive cannabinoids. Altogether, this means that the lower bioavailability of delta-9-THC when ingested seems to get balanced out by the larger occurrence of 11-OH-THC and its higher potency in the brain. The conclusion is that 11-OH-THC gets you a ‘better bind for the buck’. There aren’t many studies which investigate the correlation of psychological high to THC concentration in blood serum. But the ones who did, pointed to a better correlation of 11-OH-THC with the psychological high state. That’s interesting news for the notorious optimizer in me, because it lets you achieve more with less. I don’t want to get caught up in a discussion about drugs being good or bad. I respect individuals making decisions about how they want to think, feel and live. And as long as they don’t hurt anybody else, I think people should be free to use drugs—legal or illegal—as tools to attain their desired state of consciousness. Having said that, it’s also a fact that drugs have desired effects and undesired side effects. And for the sake of maintaining good health over a lifetime, minimizing exposure to drugs is worth striving for. Ergo, if I had the opportunity to enjoy the well-documented benefits of cannabis at a fraction of the associated exposure, that’s hitting a sweet spot. Especially for folks who are interested in achieving mild, enduring effects which blend in smoothly with their everyday lives. Lightly-dosed edibles may be a ‘sweet spot’ for health-conscious folks looking for mild and enduring effects at low levels of exposure. Coming up with the right minimum effective dose (MED) is a matter of trial and error. Bioavailability fluctuates wildly across individuals and gender. The enzymes in the liver of a man and a woman work differently, which leads to a lower rate of blood plasma clearing in women,10 something to take into account too. Next Next post: Cannabis and Breastfeeding. The Facts. 3) and share our findings. Microdosing LSD: Smart Drug or Placebo? Cannabis and Breastfeeding. The Facts. We hate disclaimers. But there are weird people out there and we have to cover our backs. So here is what some lawyers said we should say: all data and information provided on this site is for informational purposes only. sapiensoup.com makes no representations as to accuracy, completeness, currentness, suitability, or validity of any information on this site and will not be liable for any errors, omissions, or delays in this information or any losses, injuries, or damages arising from its display or use. All information is provided on an as-is basis.